According to the Online Index of Objects Launched into Outer Space maintained by the United Nations Office for Outer Space Affairs (UNOOSA), there are about 4,612 satellites currently orbiting the planet, although only one-third of them are estimated to be fully operational. Approximately half of the satellites are controlled by government and military users, while the other half serve commercial and civilian users in communication, global position services, technology development and Earth observation. Benefiting from strong demand for geospatial data and imagery, paired with the reduction of costs for building, launching and maintaining constellations of satellites, the satellite remote sensing (SRS) industry is expected to grow rapidly in the coming years and provide data services in a variety of domains including agriculture, forestry, water management, mining, infrastructure planning, environmental monitoring, transportation, security, taxation, urban planning and so on. As SRS is gradually becoming a pervasive presence in our economic and political life, it is therefore important to ask whether SRS has ramifications for diplomacy as well, and if so, under what forms and with what consequences? With steadily expanding satellite remote sensing (SRS) capability, one would expect ministries of foreign affairs to develop strategies and capacity for integrating SRS into their work. One important area of diplomatic activity that is more likely to benefit from the development of SRS technology is crisis management, and for good reasons. As discussed elsewhere, diplomatic crisis management usually involves a number of stages starting with sense-making, followed by decision-making and expectation management, and concluding with crisis-termination. As “the science and art of obtaining information about an object, area, or phenomenon through the analysis of data acquired by a device that is not in contact with the object, area, or phenomenon under investigation,” SRS can contribute to each of these stages by offering valuable intelligence for evaluating the relevance of the various signals emerging in a crisis situation and connecting the analytical “dots” between them. 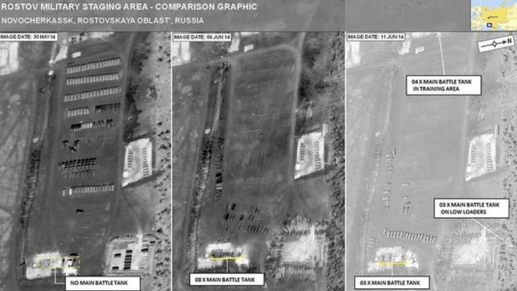 Satellite imagery was particularly useful, for instance, in the early phase of the Ukrainian crisis to document the scope of Russian military involvement in eastern Ukraine and to provide credible evidence regarding the level of collaboration between Ukrainian separatists and the Russian army (Fig. 1). 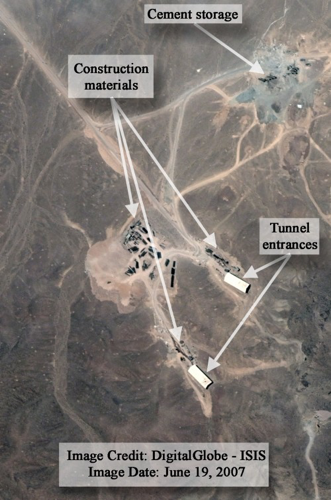 Similarly, the discovery of Iran's second enrichment plant at Fordow Fuel Enrichment Plant was largely the result of satellite imagery collected between June 2006 and July 2007 (Fig. 2). The discovery drastically changed the dynamic of the P5+1 nuclear talks with Iran, prompting former U.S. President Barack Obama, former UK Prime Minister Gordon Brown and former French President Nicolas Sarkozy to take a harsher stance against Iran. Fig. 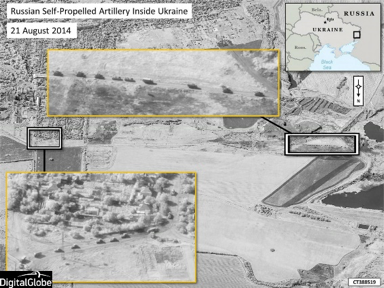 1: Satellite images taken June-August 2014 tracking Russian military convoys, the deployment of tank units and self-propelled artillery in Ukraine. Fig. 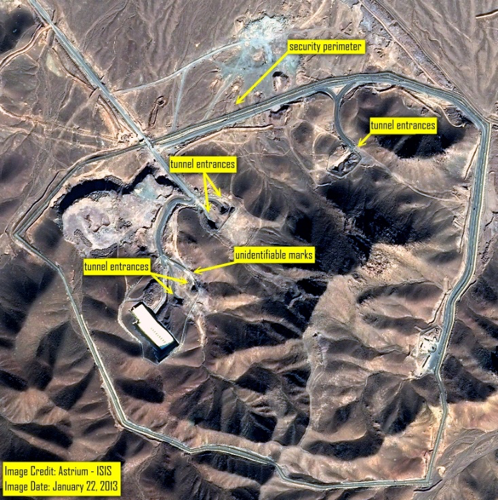 2: Satellite images of the Fordow uranium enrichment site. By developing SRS methodologies for detecting and documenting mass atrocities, the Signal Program on Human Security and Technology at Harvard University has helped provide forensic evidence of alleged mass atrocities, thus assisting government and diplomatic efforts in addressing the consequences of humanitarian emergencies. Satellite imagery helped, for instance, identify the pattern of destruction of civilian dwellings by armed actors in Sudan, primarily by the Sudan Armed Forces, thus offering indicative evidence of the intentional targeting of civilian populations. More recently, Amnesty International applied a similar technique for tracking the violence perpetrated by Myanmar’s armed forces against the Rohingya minority (Fig. 3). Data mined from satellite images could be useful for making sense of how the crisis can be brought to a point that warrants operational closure. The International Charter for Space and Major Disasters was, for instance, one of the instruments used by the World Health Organization (WHO) to assist in the management of the 2014 Ebola crisis in West Africa. The satellite images provided by the Charter provided international teams with maps that allowed them to better characterize where and how to deploy overseas medical staff and their support bases (Fig. 4). Fig. 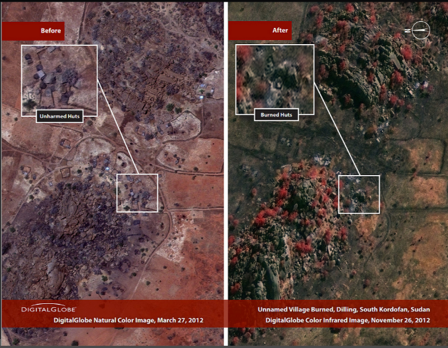 3: Deliberate burnings of civilian residential structures in South Kordofan, Sudan in November 2012 (left) and in Tula Toli, Myanmar in August 2017 (right). Fig. 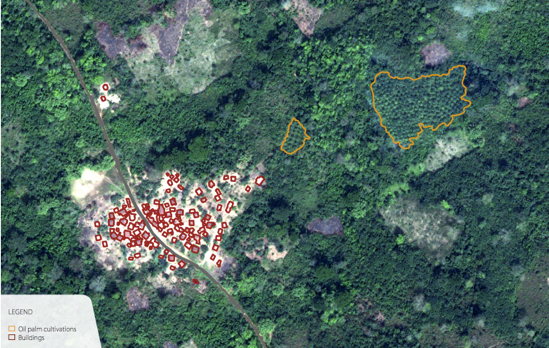 4: Epidemiologists identify settlements surrounded by dense tropical forests that are likely to increase human interaction with fruit bats, one of the main vectors of the Ebola virus. By adding a fascinating layer of technological insight to the repertoire of analytical and practical tools that diplomats use for managing crises, SRS promises to push the boundaries of how diplomacy operates in the digital age. With steadily expanding SRS capability and availability of high-res satellite imagery, one would expect ministries of foreign affairs to develop strategies and capacity for integrating SRS into their work. In addition, SRS benefits from a set of features that makes it appealing to decision-makers. It is generally accurate and objective; it has globally consistent coverage over relatively long time periods; it offers multiple levels of data resolution (spatial, temporal, spectral and radiometric); and it can present a wide range of relevant data synoptically without infringing on national sovereignty. At the same time, one should remain cognizant of some important limitations that SRS technology may pose for diplomatic activity: satellite imagery must be interpreted by people with good technical expertise; the process of interpretation is still prone to subjectivity or political biases; the technology remains expensive for many developing countries; and SRS has an unclear status in international law, as the 1986 UNGA Resolution 41/65 on Principles Relating to Remote Sensing of the Earth from Outer Space is arguably outdated. Seems to me that satellite remote sensing was originally born of necessity in the diplomatic realm, but it's nice to remind ourselves of this fact from time to time. And there is ample work left to be done. Useful article, thanks.